Last autumn Mrs. Barnes came to see me with her rabbit Thumper. She had noticed that Thumper's eyelids were very swollen. On examination Thumper's nose, ears and bottom were swollen as well. These are the classical symptoms of a dreaded rabbit disease, named myxomatosis. This really surprised me, because just 2 months beforehand I had vaccinated Thumper and Mrs Barnes other rabbit, Buttercup, against this disease.I decided to admit Thumper straight away and do a few tests to exclude other possibilities. The two other diseases I had to rule out were rabbit syphilis and dermatophytosis (a fungal infection). A hair sample was sent to the laboratory for a fungal culture, and a blood sample to test for antibodies against myxomatosis or rabbit syphilis. Unfortunately it was confirmed that Thumper had myxomatosis. Myxomatosis is caused by the myxoma virus. It was first found in wild rabbits in South America and California. In these rabbits it only caused skin lumps. However the virus causes severe and often fatal disease in the European wild rabbits. The virus was taken from Brazil to France, and released there in the summer of 1952 to control the population of wild rabbits. In the autumn of 1953 it was illegally released into the United Kingdom. Occasionally our house rabbits become infected. Blood-feeding insects, such as mosquitoes and fleas, bring the disease over from wild rabbits. So even indoor rabbits can get the disease. In acute cases the rabbits are lethargic, depressed, develop a fever and stop eating. Swelling of the nose, eyelids, lips and ears occurs first, later lumps appear all over the skin. These rabbits often die within a week because of secondary infections, like snuffles. There is no effective treatment, and supportive care is usually unsuccessful. Because Thumper had been vaccinated we decided to give her supportive care. She spent two weeks in hospital. She was put on a drip, and every day her eyes and nose were cleaned and antibiotics were given. The swelling of the eyelids became worse at first, and she could not see anything anymore. Luckily she kept eating all the time. Gradually the swollen areas went down and scabbed over. She went home, where Mrs. Barnes nursed her through a long recovery period. Controlling the disease is mainly by vaccination. However no vaccination is a 100% effective. Rabbits are vaccinated with a virus that resembles the myxoma virus, and this is effective in 60 to 90% of the cases. What exactly happened to Thumper is unclear. It could be that she only developed a partial immunity with the vaccination, that there were many infectious mosquitoes and fleas around at the time, or that the virus was extremely virulent. I do think that if she had not been vaccinated, she would not have survived. 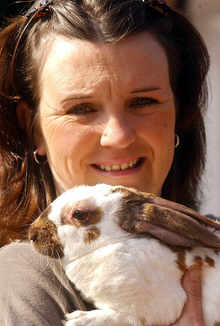 My advice to all rabbit owners is to have their rabbits vaccinated against myxomatosis. Because the disease is strongly seasonal-dependent, it is best to vaccinate in March, April or May. Ideally this should be repeated in 6 months. Insect control is very important as well. This can be done by screening of the enclosures, hanging a vapona strip near the hutch, and in applying a spot-on preparation licensed for rabbits on the back of the neck once monthly.